Did you knowx that the true power of LINKEDIN is not about finding the right people, but “being found” by the right people? 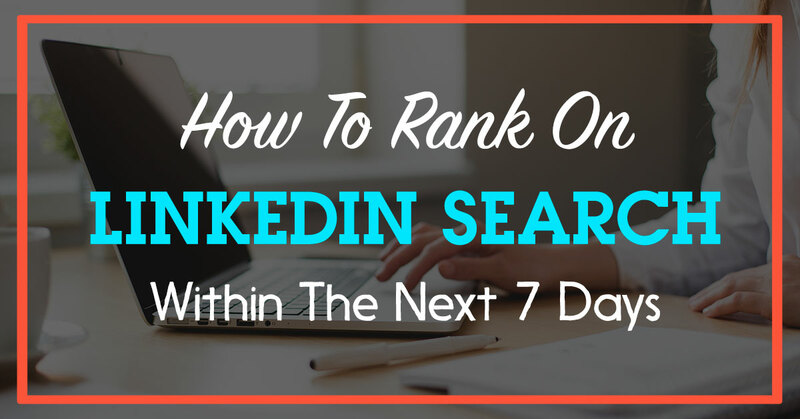 In this video, I walk you thru a few simple LinkedIn SEO steps which can help you rank on the search engines within the next 7 days. Please UNIMUTE audio below to listen to sound from this video clip. How would you like to rank on LinkedIn page #1 within 7 days? I will be giving you a few tips over the next 10 minutes and if you implement that, I can assure you that within the next 7 to 10 days, you will come up on the LinkedIn Search Engine rankings, provided the space in you are in, is not very competitive. So, lets get into Marketing Magic. Your Profile Image on Linked In. Make sure you use a good head shot profile image like how you would be in office, something more professional. Now, I’m dressed in a more casual manner because I work mostly from home. And Linked In, on the other hand is a very professional type of a network. So, my avatar on Linked In is very professional like how I would walk into meetings. Whereas, facebook is more casual. So, facebook is like home and Linked In is like office. Linked In is a professional environment. So, tip #1 is make sure you optimise your profile image with a good headshot of yourself. The second tip here is your description. The description is so very important for you to rank for your keyword. Now, I’m the co-founder of Scion Social. But I have not put co-founder of Scion Social on the description because nobody cares about me being the co-founder and honestly, nobody cares about Scion Social. So, I had to put in a keyword for which I wanted to be found. So, I’ve put in here, Social Media Speaker. I am a Social Media Speaker and I have trained over 3000 entrepreneurs and I am a sought after Lead Generation Speacialist & Strategist. I’ve put these as my core aspects in my description. If I go into Linked In and type here, in the search engine, Social Media Speaker, you see what happens here. Out of 4000 search results, I’m coming right on top of the Search Engine because I’ve used a special character, a tick mark for me to rank for that. Previously, I used to rank for Social Media Expert, Blogging Expert, Linked In Expert, Facebook Expert and so on so on. But its a very competitive space, so I needed to be creative and I wanted to take the space of Social Media Speaking as such. The next point is your Summary. The summary os one of the most important things that you need to optimise. If you look at my summary here on Linked In, this is how it looks. Are you in Sales, Business Development or an Entrepreneur? If you are, then I can help you. So, the whole mind set when crafting a summary on Linked In, it has to be on how you can help the other person and not to get business out of them, initially. And then I’ve structured the summary in such a way, I was an entrepreneur at heart, I walked away from a high paying Corporate Job. I have so many hours of experience and I actually made a list of all the possible buzz words in my industry and I put them all into the summary. For example, you can see here Twitter, Linked In, Instagram, Blogging, Search Engine Optimisation, PPC, Traffic Building, Conversion and Analytics. So, the next step is when you’re crafting a summary, don’t just write a boring summary. Have an intention to help the other person. Ask a question when you start with. Write in such a way that you’re talking to one person. Make a list of the keywords related to your industry or buzz words and include them into your summary. And then if you scroll down my summary, you can see I’ve included all the keywords or buzz words here, again as a checklist because some people like to read paragraphs, but most people like to read checklists. So, repeat those keywords once again or buzz words, what you want to be known for in your industry and then you go down. And the other important thing that lot many people don’t know is that you can add videos on Linked In. So, I have 2 videos of myself. One is why I started my business Scion Social and the other video is about me. Where am I coming from. So, by just optimising this small tweak that I just shared with you now, trust me in the next 7 to 10 days, you can start coming up on Search Engines faster than you can ever imagine provided again a disclaimer, provided you’re not in a very competitive space. Because I am in a very competitive space, there are many Social Media Experts, I used to rank for that keyword initially, but now, a lot of other people are coming up on the search results. So, you need to look at your niche and optimise it in that way. If you found this video very useful, I want to give you a very special offer, I want to give you something really cool. Ive created over 52 training videos. So, I would like you to send me a message because I want you to ask me for the offer and I will give you the offer. So, you got to go to asksidz.com and just type “launchpad offer”. I have my robot, sidzot actually working for me 24/7. My robot assistant will actually send you the link with the offer details and you can go and pick up that course which is available online. 52 videos, 8 hours of training and what I shared with you now is just one small drop of the different strategies & hacks that I have shared on Social Media. I repeat, go to asksidz.com and send me a message saying “launchpad offer”, all in lowercase and sidzot will give you the offer. If you really liked this post, share your comments. below. You have given wonderful tips on LINKEDIN SEO Ranking in 7 days . That’s great to know Mohan! All the best.